Ecological Forest Management Handbook is a volume in the Series: Applied Ecology and Environmental Management. Forests are valued not only for their economic potential, but also for the biodiversity they contain, the ecological services they provide, and the recreational, cultural, and spiritual opportunities they provide. The Ecological Forest Management Handbook provides a comprehensive summary of interrelated topics in the field, including management concepts, forest models, and ecological indicators. Featuring contributions from experts on the three main forest types�boreal, temperate, and tropical�this book presents in-depth coverage of important issues in ecological forest management and includes case studies addressing ecological and socioeconomic issues. It illustrates how ecological forest management is a complex process that requires broad ecological knowledge while giving readers a deeper understanding of basic principles and applications. Dr. 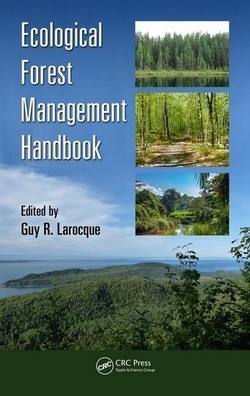 Guy R. Larocque is a research scientist for the Canadian Forest Service, a sector of Natural Resources Canada, at the Laurentian Forestry Centre, Qu�bec City, Qu�bec, Canada. He is also an adjunct professor in the Faculty of Natural Resources Management at Lakehead University, Thunder Bay, Ontario, Canada, and the Forest Research Institute at the University of Qu�bec in Abitibi-T�miscamingue, Qu�bec, Canada. He is a member of the editorial advisory board of Ecological Modelling and the International Journal of Forestry Research, and is also associate editor of Ecoscience. He has published papers on productivity and succession, carbon cycle, uncertainty analysis, and the development of empirical, succession (gap), and process-based models for forest ecosystems.